Field visits have been an integral part of all IASC Conferences. These trips are usually in alignment with the theme of the conference, and aim to give the delegates an overview of some of the practical aspects surrounding the management and governance of CPRs. The 13th Biennial Conference on Commons was organized in partnership with various practitioner organizations who were working with CPRs and departments of the central and state governments in India. In keeping with the overall flavor of the Conference, the single day field visits were organized in partnership with many NGOs that were working on different aspects of commons in and around Hyderabad. A snapshot of the field visits is given asunder. The visit to Kadampally in Kosgi Mandal, tried to show how conflicting interests are balanced while managing commons. The case in point was the management of tanks, wherein the interests of farmers and that of fishermen had to be balanced, in order to ensure that the resource is optimally and sustainably used. This was followed by a visit to a visit to Mallayyapeta village, to understand issues pertaining to groundwater governance. The distance to the village was roughly `150 kilometers from the venue, and took 3 hours to reach. The visit was coordinated by WASSAN, Hyderabad. this field visit covered Theriala and Gummadavali villages in Nalgonda and Warangal districts respectively. The issues highlighted on this visit included the various threats being confronted by CPRs in the Deccan region, like the proliferation of bio-fuels, diversion of land for alternative uses and so on. As in the case of all the field visits, extensive interactions with members of the communities were arranged. The sites were located at about 120 kilometers from the venue (about 3 hours travel time). The visit was anchored by Anthra, Hyderabad. the first port of call in this visit was Manthur, in Narsapur Mandal, Medak District. In this village, the delegates tried to understand and appreciate a community-led struggle to protect a patch of forest land. Next, the contingent visited Mohammadpura, where an attempt was made to understand the functioning of the institutions that were in place for the governance of CPRs. The last point of visit was Medak Church. The sites were about 70 kilometers from the venue and took nearly 2 hours to cover. The visit was quarter-backed by Center for People’s Forestry. in this visit, an attempt was made to appreciate the rich cultural heritage of Hyderabad. The sites visited included Taramati Baradari, Qutibshahi Tombs, Golconda Fort and Charminar. The field visit was designed to spotlight knowledge and use of four specific technologies -- the system of hydrology, acoustics, cooling, and steam baths that are all built within the architecture of these monuments. Furthermore, these buildings were shown to be examples of how knowledge of science was integrated in the construction of structures during the medieval period. Participants in this visit saw instances of “organic architecture”. The sites covered in this field visit were within Hyderabad; and the visit was underpinned by Center for Regional Studies, Hyderabad Central University, Hyderabad. This visit covered the well-known Adarsha Watershed in Kothapally, Rangareddy District. The visit highlighted how science could play a pivotal role in sustaining agriculture. The visit tried to encapsulate the various interventions that made the watershed a much-referred one. The site was about 60 kilometers from the venue, and was anchored by International Crop Research Institute for Semi-Arid Tropics (ICRISAT). The visit to Chinnaghanpur in Medak District tried to look at the different institutional mechanisms that were put in place for the management of watersheds. In addition, the various physical structures that were built and the mechanisms evolved for the maintenance of the same were also looked into. The site was about 70 kilometers from the venue and comprised about 2 hours of travel. The visit was anchored by International Water Management Institute (IWMI). this visit focused on the various challenges and threats that are confronted by the lakes of Hyderabad. These included pollution and rampant encroachment. The visit also tried to project the various ways in which civil society groups were trying to counter these threats. The sites were covered were within Hyderabad, and the visit was anchored by Save Our Urban Lakes (SOUL). Diverse rain-fed food crops replaced by mono-crops- decreases availability of graze-able crop residue when “private land” becomes commonly owned land post harvest. The visit to Kamareddy looked at the functioning of the women’s SHGs in different levels, in the state of Andhra Pradesh. The SHG movement is a watershed in the efforts to bring women in the fold of financial services; and the case of Andhra Pradesh is often sited as a shining example. The visit looked at the institutions at different levels—village, Panchayat, Mandal and District and tried to understand their functioning and their salient features. The site was about 160 kilometers from the venue, entailing about 3 hours of travel; and was put together by APMAS. The visit to Enabavi, Warangal district brought to fore, the attempts made by the community to reprise traditional agricultural practices, to ensure that agriculture remained a viable livelihood source. The site was about 110 kilometers from the venue and took entailed 3 hours of travel time; and was moored by Center for Sustainable Agriculture, Hyderabad. in this visit, attempts to establish the sovereignty of the communities over traditional knowledge like seeds and the agricultural practices were highlighted. In addition, the efforts of the people to take control of the media and the content that would be presented therein were also showcased. Zaheerabad, where the visit took place, was about 110 kilometers (3 hours) from the venue; and the visit was underpinned by Deccan Development Society, Hyderabad. here, the travails of the present-day weavers in Pochampally were encapsulated. The trip comprise of visits to the local tourism information center for an overview of the weaving practices and the state of the industry in the present day. This was followed by a visit to some of the households of weavers, to look at the steps involved in weaving. A visit was also undertaken to the house of Vinobha Bhave, the founder of the Bhoodan Movement; where a discussion was undertaken with members of the local community to understand the management practices vis-à-vis the local tank. Finally, an interaction was arranged with the members of the weavers’ cooperative, to understand the challenges confronted by the members of the community. 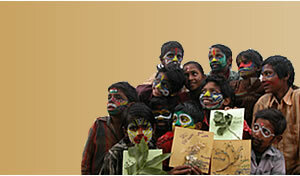 Pochampally was about 60 kilometers from the venue and was supported by Akshara. the visit to Nalgonda was undertaken with a view to understand the efforts at community-led conservation and development of irrigation tanks with self-help and rights-based approaches, so as to ensure long-term sustenance. The field visit tried to throw light on socio, cultural, environmental and technical aspects of tank irrigated agriculture systems, which remain as a backbone for livelihoods in this region. As most of the field visits entailed long travel time, sufficient stop-overs were planned to enable delegates to cope with the fatigue. Further, a number of recce visits conducted prior to the d-day ensured that the routes were well chalked out and the trips were completed with the minimum of difficulty.